The HPP OTM Protocol | Robert Mitchell Jr.
Update (11/13/2018): I just realized that I forgot to report on our findings. After a of doing the HPP-OTMs, we all agreed that they were fun, they really pushed us to O2Max, and they were a nice change of pace. But in the final analysis they were too short and too easy. Constitutionals — seven high-rep Calisthenics done back to back with no rest breaks longer than a slow 12-count — are still the Cabal Fang standard. That said, I’m rolling what we learned from this into a new idea with the working title MBFD. Keep an eye out. Here is a photo of my training journal showing the dice for randomizing and the chart I came up with. How do our OTMs work? Well, I have a list of 12 exercises — that are as martial-arts-specific as possible! — which I have placed on three, four-sided dice (see photo above) so that I can select three of them at random. Select 3 exercises at random — one from the Holding List, one from the Pulling List and one from the Pressing List. Set timer for 1 min intervals. Perform as many reps of Exercise #1 as you can. At failure, rest until timer beeps, getting in position for the next exercise as you do. Repeat with Exercise #2. Again, when you reach failure, breathe deeply as you get in position for exercise #3. Cycle through two more sets for a total of 9 minutes. 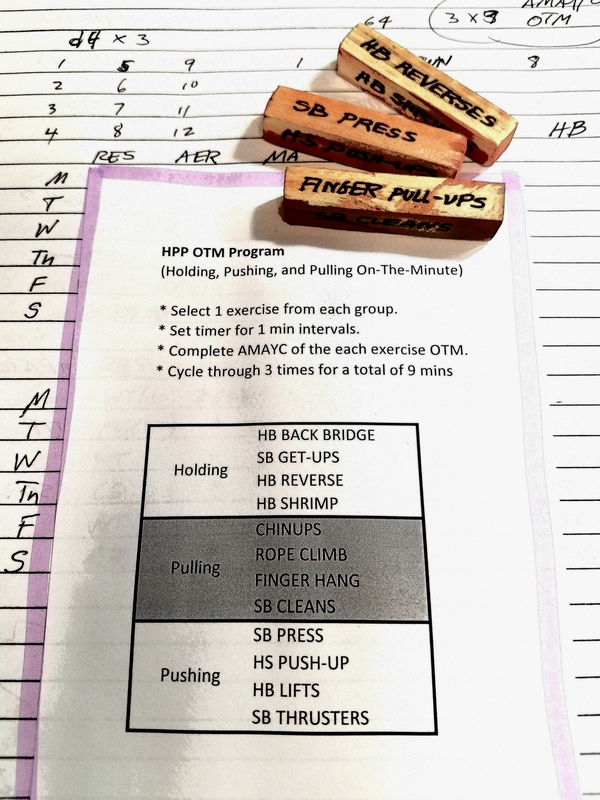 Record your max reps of each exercise in your training journal to keep track of PRs. The beauty of this program is that as strength goes up the rest periods go down. I shrinks to fit! This entry was posted in Martial arts and tagged HPP, OTM. Bookmark the permalink. Pingback: Straight Blast: Training Involution #115 | Robert Mitchell Jr.